Hi all, my name is Kev and after lurking on here for a while I picked up a 2001 (Y) hdi rapier saloon in china blue yesterday. It has done 115k but has no history so i'm going to change the cambelt, waterpump and give it a full service. It has had electric leather seats fitted at some point but could someone tell me if all 406 leather seats have heating elements and how easy it is to connect it up? I'm sure someone will correct me if I'm wrong but I'm pretty sure they had heaters. Did you check the seat for wiring? Ok yours probably won't have the big memory connectors but this should give you an idea. If it doesn't have heaters it could just have the connectors there as dummies, so check for wires heading off into the seats. I'm hoping that your car has all the wiring and just needs the switches and relay but all bets are off on the cars I'm afraid, some of them came with damn all extra wiring in them. I haven't had chance to check the wiring yet. Will do it later today. Seats need a bit of work, the drivers seat seems a bit loose on it's runners. If wiring is there, where does the relay need to be fitted? Just to add. The seats are from a d8. Don't know if that makes any difference. Hi & welcome to the forum, Kev. 4oh6 wrote: Just to add. The seats are from a d8. Don't know if that makes any difference. 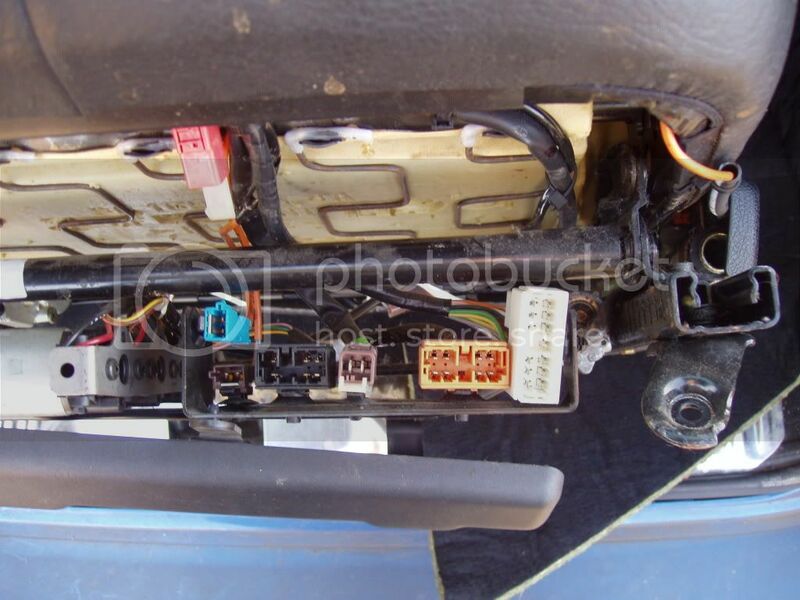 I've checked the wiring under the seat and it has wires running to what I assume are the elements but I removed the blanks where the heated seat switches should go and there are no connections beneath. Is this a big problem? Also, the car came with a faulty sony h/u so I've replaced it with another sony I had kicking around but I can't work out how to run a constant live so it doesn't reset every time I turn the ignition off. I've heard of connecting the red to yellow wire and vice versa but when I tried this the stereo turned off when I switched the ignition on, and turned on when the ignition was turned off From the cars wiring harness can anyone please tell me which wires do what regarding power? H/u power connector is the balck 8-way one. Looks like permanent +ve = pin 7, wire no. BH10A, (mauve). Ignition +ve = pin 6, wire no. AH25B, (white). Whatever you do, don't connect anything to pins 2, 3 or 4 - these are the van bus. Pin 1 is the phone mute. Thanks for that. Stereo all wired in including new aerial and lead. Some muppet had broken the aerial and glued it to the roof, it wasn't a pretty sight. Hi guys, my names Damian and I've just joined. I've got a d8 coupe which has cloth manual seats, iv got hold of a full leather interior from a d9 including the ecu and wiring which they hacked from the d9. My car has side airbags and seatbelt pre tensioners, I also have two extra plugs going into blanks, one brown and the other is yellow. Do I need to unravel the hacked loom and scrap most of it from d9 and just use wiring that goes from plugs to ecu. I'm not fussed about heat or memory, just want adjustment. Hope someone can help, be much appreciated. Hi guys, I've just found and brought a conversion ecu so electric heated seats can be fitted into any 406. As I already have an ecu and loom from another car I intend to see what wires have been used to make it possible, if it works I will post on here so anyone can see and know how to do it and hopefully ease alot of headaches lol.